Wheat & Weeds: Blessed Thanksgiving! 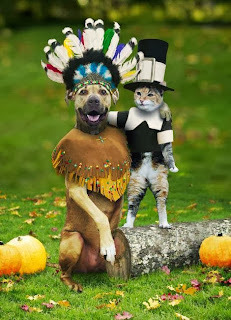 I went looking for a lovely Thanksgiving illustration for this post and found this instead. Not the mood I was going for, but too silly not to share. Happy Thanksgiving, internet friends! Here's Msgr. Charles Pope with lovely thoughts to help inspire gratitude. And of course a little Lincoln for the occasion. P.S. I solemnly swear NOT to sully a social occasion by serving as an instrument of propaganda.